Welcome. Click the image above to see examples and use our Visual Navigation page to access brick numbering documentation for a historic façade disassembly and reassembly reconstruction project. 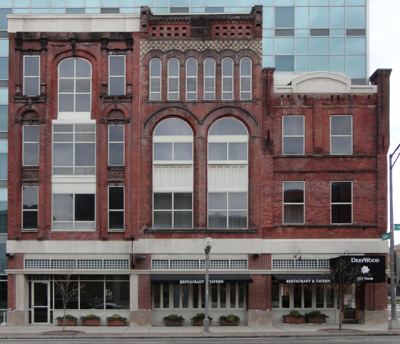 Our approach to historic preservation is Conserve first, Rehabilitate, and then Restore. But sometimes you have to Reconstruct. Brick and Stone after all are the ultimate Green Building material that can almost always be reused. What do you do to track the results of sounding every brick or stone, or in the case of a complete disassembly and reassembly? Wouldn’t it be nice if you could number bricks or number stones in an organized fashion for tracking and inventory so you can put the brick back where they belong during reassembly, and achieve the exterior façade preservation effect the client wants. Now you can. And you can do it effectively and efficiently with PhotoDrawing blue print substitutes. Click here for and on-image annotation example that drills down to brick detail. Or use use the Visual Navigation page to see drawing pages with brick number in both color and CAD outline style, or TexturPrint drawing showing surface texture. Or compare color images to drawing pages using a wireless connection right in the field.